I confess that I have always liked Will Ferrell's movies and have not only seen them in theaters, but I have also given DVDs to people. Well, not only has Ferrell been "deemed the worst celebrity signer" for autographs and apparently just not very friendly to his fans when they meet him, but he is also a big donor to gun control efforts. Apparently, other big contributors include actors Peter Weller and Amy Brenneman. 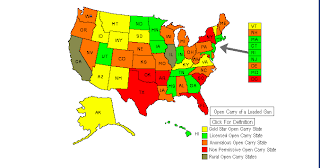 For those interested in the interactive version of this state map of open carry laws see this link. This site has a lot of interesting information, though the only additional information that I would like is on when the different state laws have changed. My guess is that global warming fanatics realize that a lot is at stake in this next election. I think that the more time that goes by, the more obvious it will be that these various predictions of concern on global warming are wrong. The problem is that if a global warming agreement goes into effect, those pushing for more controls will say that their regulations are responsible. If we can get by the next administration, I would guess that the pressure on all this will begin to subside and those who have been pushing for all these regulations will look really foolish. He urged delegates to agree to an open-ended deal that could be enhanced after the Bush administration leaves office and the United States policy changes. Dumb Academic Study: "Students Who Pull All-Nighters Have Lower GPAs"
ALBANY, N.Y. — Students who rely on all-nighters to bring up their grades might want to sleep on that strategy: a new survey says those who never study all night have slightly higher GPAs than those who do. Here is the problem: presumably those who are pulling the all-nighter are way behind in their studies. Those who are caught up don't have to be up all night. The real question is not to compare the grades for those who are up all night with those who aren't, but to ask what grades would those who did stay up all night get if they didn't do it. Those are two different questions. We welcome a very special guest to the show: Larry Bourbonnais is the 59-year-old Vietnam Vet that distracted crazed shooter Matthew Murry long enough for Jeanne Assam to take him down with a few well-placed shots of her own. Larry was shot during the encounter and he joins us to tell his story. Don't miss it. Firearm expert John Lott joins us to dissect the shooting at New Life Church and its impact on the gun community. If you have questions for a bonafide gun expert, give us a call. You can listen to the third hour of Kirby's show here (skip the first three-quarters of the show to go right to listening to the discussion on the church attack). The professor here writes that this professor finds it necessary to write under the pseudonym of "Thomas Benton" when discussing the gun issue tells you something about academia. What can be done to protect faculty members from potentially dangerous students? Ultimately, nothing. Or so it seems. First, it is our job to demand difficult tasks of people and judge the results in ways that can have consequences for their future. Sometimes we are called upon to challenge students' beliefs in ways they may deem offensive. Second, we cannot pursue disciplinary action within a college unless we are willing to accept the possibility of personal retaliation by the student outside the college's area of jurisdiction, off the campus, or after graduation. Moreover, disciplinary action against one student does nothing to restrain the actions of a disgruntled student's allies, possibly after a long interval. Third, it is increasingly difficult for us to maintain our personal privacy because of the circulation of information on the Internet. . . . .
During the past seven years, there have been several incidents of vandalism at our house in the country about 10 minutes from the college. Our mailbox has been destroyed twice, incidents I have written off as teenage pranks. We frequently hear gunshots in the night, but there are a lot of hunters in the country who shoot at animals and other targets from their cars. About once a year, we find bags of garbage split and scattered on our property, but people dispose of things that way around here without personal malice, I assume. Some things can't be dismissed, however. One night I heard a chainsaw running, opened a window, and realized someone was in our front yard, cutting down one of our trees. I came out with a flashlight, and the chainsaw-wielder ran to the passenger side of a pickup truck, and the two people roared away. I didn't get the license number; the car's lights were off. The next day a police officer took notes and said nothing could be done. After that, we installed more outdoor lighting and adopted a German shepherd, and I bought a 12-gauge shotgun and learned how to use it. There is no way I am going out in the middle of the night to investigate intruders again with nothing but a flashlight in my hands. . . . It appears that malls, schools and businesses that post "gun-free" signs increasingly are becoming prime targets for people who want to cause harm to unarmed citizens ("Police seek link in Colorado attacks," News, Monday; "Lives, loves cut horribly short," News, Friday). When will those who pushed for gun-free zones realize that they are contributing to tragic situations? They are preventing legally armed citizens from interceding and preventing casualties. By the time law enforcement arrives, the shooter either commits suicide or escapes. Thankfully, New Life Church in Colorado Springs had armed security guards, and one shot the shooter, who then killed himself. This probably saved many lives. Nebraska and Utah, where mall shootings recently have occurred, have laws that allow individuals with permits to carry concealed weapons. Both states also allow some private property owners to declare their property as gun-free zones. The conclusion is that people intent on killing do not obey the laws, and disarming law-abiding citizens results in more death. The Omaha mall was a gun-free zone. One would think that this was at least as important as the type of weapon used because it shows that the young killer was not deterred by the signs or the law. In fact, he was probably emboldened by it, knowing that there would be no armed resistance to his killing spree. Thanks very much to Rich for sending this link to me. "I saw him coming through the doors" and took cover. I came out of cover and identified myself and engaged him and took him down. God was with me. I didn't think for a minute to run away. "Human Evolution Seems to Be Accelerating"
In real life . . . People are evolving more rapidly than in the distant past, with residents of various continents becoming increasingly different from one another, researchers say. "Colorado church hero "security guard" was volunteer church member with carry permit"
(CNSNews.com) - Many people are expressing relief that a volunteer security guard used her own gun to stop a man on a shooting spree Sunday. "She probably saved over 100 lives," the Brady Boyd, the pastor of the New Life Church in Colorado Springs, said on Monday. The female guard, a church member dressed in plain clothes, killed the gunman after he opened fire at a mega-church in Colorado Springs. Boyd said she "rushed toward the attacker and took him down in the hallway" as he entered the building. The shooting erupted around 1 p.m., at the end of a service, when 7,000 people were either inside the New Life Church or just leaving. "He was just walking and shooting," the Denver Post quoted one witness as saying. The gunman, still unidentified, shot at least five people, killing two teenage sisters, the pastor said. The girls were 16 and 18 years old. Their father, also shot, is listed in father condition. The gunman is believed to be the same young man who shot and killed two people earlier the same day at a missionary training center in suburban Denver. In that case, the gunman opened fire after he was refused permission to spend the night at the missionary center. The gunman was described as skinny, in his 20s, about 6 feet tall and dressed in black, police said. KUSA-TV reported that the gunman was wearing a "tactical helmet and body armor." The church's pastor said the New Life Church "prepared in advance" for a possible attack, after hearing about the shooting at the missionary training center. . . . This woman was really just a private CCW holder who asked the minister to carry a concealed handgun at the services. Apparently, there were others who also were allowed to carry their concealed handguns also at the church. I had posted on this yesterday, but I must thank Andrew Rothman for finally providing me a link to this. Good this man was able to defend himself. Miami ;; An elderly man takes matters into his own hands when 4 robbers follow him home from the bank. Police said he shot and killed one of them while he was being attacked. More from Breitbart.tv. This site is really becoming an indispensable resource. The gunman in the shootings at the New Life Church was shot and killed by a church security guard, Colorado Springs police chief Richard Myers said. . . . . I have been traveling to Canada today and I don't know much else about what has happened with the other shooting. Thanks to Andrew Breitbart letting me know about this. Cartoonist Mike Lester "channels John Lott"
On the other side, Chuck Carlson has this column. What this piece fails to note is that there are no problems created by those with concealed handgun permits. It is also not necessary that everyone carry a concealed handgun. To me the interesting fact is how incredibly rarely people have to fire their guns to stop these attacks. Even if a small percentage of people carry a gun, you can have a strong deterrent effect. Pennsylvania and Indiana for example have 6.5 percent of the adult population with permits. Even a group of 16 people means that on average, if all permitted people carry a gun, you have about a 100 percent chance that on average an attacker will find that at least one of his potential victims will be able to protect themselves. A group of Toronto-area children are asking the Ontario Human Rights Commission to force their school to launch mandatory lunch-bag inspections to screen out foods to which they have severe allergies, a case which could make all Ontario schools do the same. . . . . Possibly they can also check for improper drawings on guns at the same time. Thanks to Bruce Mills for sending me this link.